Sold by Beach Camera Same Day Shipping and Fulfilled by Amazon. Gift-wrap available. 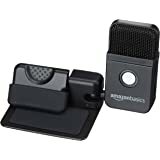 Amazon's Choice for "audio technica microphone"
Sold by Beach Camera Same Day Shipping and ships from Amazon Fulfillment. 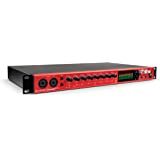 Audio-Technica manufactures products that set quality, durability and price/performance standards for live sound tours, broadcast and recording studios, corporate and government facilities, house-of-worship venues, and more. A-T microphones are chosen for critical government installations such as the U.S. House of Representatives and Senate. 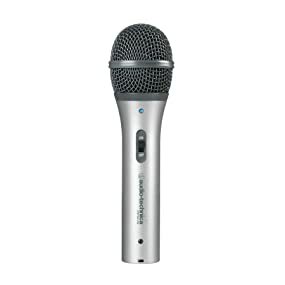 Audio-Technica microphones and wireless systems are also selected for major broadcast music events. 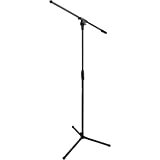 Tripod desk stand with folding legs for secure and easily portable tabletop use. 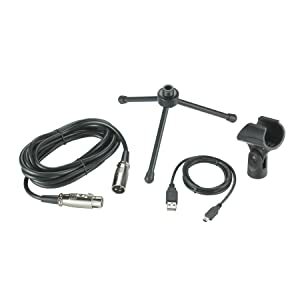 Threaded stand clamp attaches securely to the supplied tripod or to a conventional microphone stand. 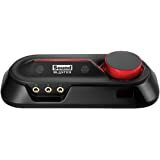 Adjust headphone volume with easy-to-use controls on the bottom of the microphone. Durable metal construction for long-lasting performance. USB and XLR cables included. Compatible with Windows and Mac. A self-made man and audiophile, Hidéo Matsushita was the former Director of the Tokyo Museum of Modern Art. It all started in his workshop, with the hand crafting of stereo cartridges. 50 years later, Audio-Technica has become one of the global leaders in audio innovation. This is an amazing mic for the price. I'm a budding podcaster and podcast editor and this mic beats a Sno Ball & Blue Yeti hands down. Comparatively, the Sno Ball picks up every background hum and sometimes random sound frequencies so the finished audio track will contain constant fuzz behind vocals that only goes away if the speaker mutes themselves. When using a Sno Ball, it's not always apparent during a live recording, but the audio track will have picked it up. And since it's underneath the vocals, an editor can only do so much without turning the speaker into sounding like a robot. 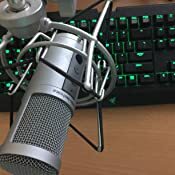 The only thing I would recommend this mic for would be for better-than-a-cheap-headset sounding Skype, Discord or TeamSpeak/Vent conversations but not for audio recordings. The Blue Yeti picks up every single background noise but is usually pretty good with not picking up buzz. Got a squeaky door? Chair? Scratch an itch on your arm or face when you're near the mic? Drop a pen? You got it, the Yeti will pick all of that up with enthusiasm. The audio quality is really decent, however, but, dang, if it doesn't want to record absolutely every sound that occurs within the room. 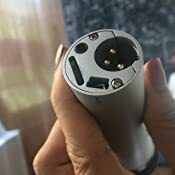 This mic, the Audio-Technica ATR2100-USB, since it uses a cardioid polar pattern, doesn't pick up any noise from the sides or rear, making background noise pick-up very minimal. I have it right next to and slightly in front of my desktop and it never picks up the hum of the fans or noises from the processor. I've heard from musician friends that this is a challenging mic to work with on stage as a singer because you basically have to inhale the mic to be heard, but for podcasting, I find that the closer I get to the mic, the more pronounced my pops are. I can be a good 6 inches away and my vocal quality is great, without the pops. 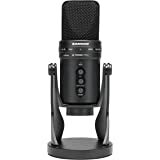 When I first got into podcasting, the reason I ended up choosing this mic as my starter mic was because all the podcasting equipment advice I kept researching pointed to this mic over a Yeti for overall sound quality and a better price point. Quality and a cheaper price is something it definitely delivers on. This mic will last me a really long time and couldn't be happier about my purchase of it almost a year ago. If you're serious about wanting really good audio with little hassle (especially in post), I highly recommend this mic. Super easy to set up, too. Just plug the USB into your computer and you're good to go. I run a small time youtube channel and this records my commentary fine. Since this is dynamic microphone it will mostly capture sound from the direction it is pointing. This is different from a condenser microphone which will capture any sound anywhere in the room. 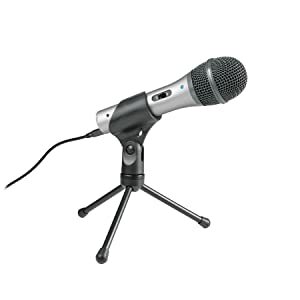 This microphone is useful if you're recording in an environment where you cannot control the environmental sounds. 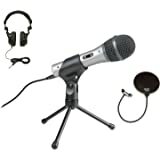 This microphone is great for any amateur podcaster or let's player, since you're probably not going to have access to a quiet recording studio. 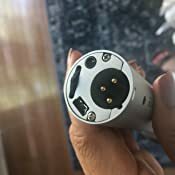 Another perk of this microphone is that has both xlr and usb connections. 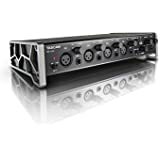 This leaves you room to grow and if you decide to get a mixer then you can just switch from usb to xlr. There are a few cons. I have a mechanical keyboard, so it's a bit louder than the average keyboard. This microphone will still pick up the keyboard sounds. These sounds aren't very loud and don't distract away from my commentary so it's not really a problem for me. Just don't expect it to eliminate every single sound perfectly. The other con is that it records kind of quietly so you may need to crank up your gain a bit. From my understanding all dynamic microphones are like this. The gain will create a fuzzy sound in the background. You can easily remove this sound in post though. Even Audacity (free) has a sound removal feature that will remove this sound effectively. 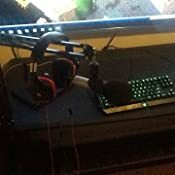 Once the fuzzy background sound is eliminated, my voice sounds nice, clear and proffesional. 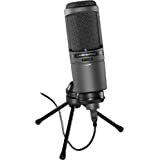 This is a great beginner microphone and your money is well spent on this microphone. If you found this review helpful then please hit that helpful button. 1.0 out of 5 starsThree micrphones in two months. Very poor quality. Everyone loves this microphone. 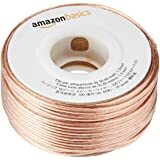 Perhaps I have the worst luck in the world, but I am getting ready to purchase my third one since starting my podcasting job two months ago. The USB port in the last microphones has failed. The first was a refurb, so I thought that was the issue (it was broken right of the box). This one worked fine for a month and now is suffering the same issue where the USB port on the bottom of the microphone falls into the microphone, rending it useless. The return window has closed, but I'm hopeful it's under warranty. I do keep it in a hard case and take care of it, so I have to assume that the new microphones are poorly manufactured or they're missing a crucial step in the inspection process after manufacturing. The quality is phenomenal. 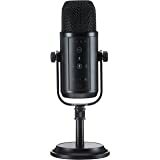 I use it for voice overs on YouTube and it never misses a beat. It sounds amazing for such a cheap USB item. Even with a foam ball of sorts, it does sometimes pick up on "plosions". This is usually when you're too close to the microphone, however, and isn't a constant thing. The plosions it does pick up on are never big (sometimes only noticeable to audiophiles). Standing too far away from the microphone can result in very quiet audio. Even with turning the gain up to its maximum, I would say you should not be more than a foot away from the microphone, and you really shouldn't even be that far if you're wanting the maximum results to be warranted. That is the function of a dynamic microphone however, and is to be expected. Speaking of its performance in terms of dynamic-ness, it does a good job of keeping most background noise out. The static is only slight, and is never anything that can't be fixed with a few clicks in even the most standard of audio editors. It does tend to pick up oh-so slightly on noises to the left and the right of the microphone. It's not so dynamic that if you slightly move your head away, you suddenly can't hear you anymore, but it's dynamic enough to where the main focus will be what's directly in front of the microphone for the most part.